HomeForeclosures and EvictionsStop Fannie Mae From Evicting the Hernandez Family! | A detener el Desalojo de Fannie Mae hacia la familia Hernández! Stop Fannie Mae From Evicting the Hernandez Family! Ludim and Gabriela Hernandez have raised their three daughters in the home in Southwest Detroit where they’ve lived for over a decade. Fannie Mae, the failed mortgage company taken over by the federal government, is now moving to evict them. After the banks trashed the economy, Ludim Hernandez was laid off from his construction job and fell behind on his mortgage in 2012. The mortgage company failed to communicate with the unsuspecting family in Spanish, as the law requires, and the home was taken at Sheriff’s auction by Fannie Mae. Thinking it was their only option, the family gave a for-profit “mortgage consultant” their life savings of $15,000 to recover the house. 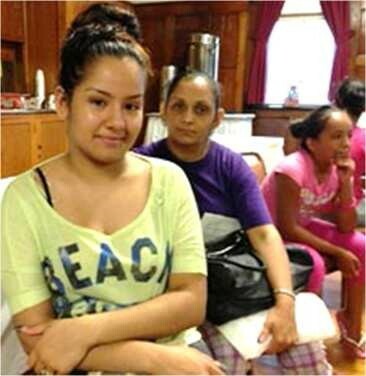 This scam artist ran off with the money and the Hernandez family is now facing eviction from their home. We are on the trail of this thief, but the danger now is that Fannie Mae will evict on or after September 16. We can help fend off the eviction while the non-profit Center for Community Justice & Advocacy is making an offer to buy the home and sell it back to the family at market value. The last thing Detroit needs is another vacant home and another good neighbor on the street! Fannie Mae gets billions in taxpayer money to pay banks and investors for their losses, yet it is demanding $83,000 from the Hernandez family for a home worth barely a tenth of that inflated price. 1) Call/email Fannie (contact info on back of flyer) and tell them to sell the home to the Center for Community Justice and Advocacy so the Hernandez family can stay in their home. Fannie sells to investors at below market, so it can sell to the Center on favorable terms. Urge your congressional representative to call as well. 2) Join the vigil at the Hernandez home to prevent the eviction. Send contact info (phone and email) and we will alert you if and when the eviction order is signed. Email us at DetroitEvictionDefense@gmail.com, or call UAW Local 600 at 313-429-5009. Tell them to sell the house at 1136 Morrell St. in Detroit to the Center for Community Justice and Advocacy so that this non-profit can sell the home back to the Hernandez family for a fair price! Fannie Mae has done this before and can do it again to prevent an unjust eviction. Ask your congressional representatives to contact Fannie Mae. Meetings: Detroit Eviction Defense holds an open meeting every Thursday, 6pm, at Old St. John’s Church, 2120 Russell, Detroit (immediately south of eastern market, near the corner with Gratiot Ave.) Bring your concerns and ideas. 1136 Morrell St. in Southwest Detroit is one block east of Junction and three blocks south of Vernor. A detener el Desalojo de Fannie Mae hacia la familia Hernández! Ludim y Gabriela Hernández han criado a sus tres hijas en su casa en Southwest Detroit donde ellos han vivido por más de una década. Fannie Mae, la quebrada compañía hipotecaria y tomada por el gobierno federal, está ahora desalojándolos. Después de que los bancos destruyeron la economía, Ludim Hernández fue despedido de su trabajo de construcción y se atrasó en el pago de su hipoteca en 2012. La compañía hipotecaria no se comunicó en español con la confiada familia, como la ley exige, y la casa fue puesta para la subasta del Sheriff por Fannie Mae. Pensando que era su única opción, la familia le dio a un negociante “consultor hipotecario” los ahorros de su vida de $15,000 para recuperar su casa. Este estafador arrancó con el dinero y la familia Hernández esta ahora enfrentando el desalojo de su hogar. Nosotros estamos tras este ladrón, pero el peligro ahora es que Fannie Mae los desalojara el 16 de Septiembre o después. Nosotros podemos ayudar a evitar el desalojo mientras la organización Center for Community Justice & Advocacy (Centro por la Defensa y Justicia Comunitaria) está haciendo una oferta para comprar la casa y venderla de vuelta a la familia a un justo precio de mercado. Lo último que Detroit necesita es otra casa abandonada y otro vecino en la calle! Fannie Mae gana billones de dólares por el dinero de los que pagan sus impuestos para pagar a bancos e inversionistas por sus pérdidas, y todavía están exigiendo $83,000 a la familia Hernández por una casa que escasamente vale un décimo de ese precio inflado. 1) Llame/ envíe e-mails a Fannie (información de contacto atrás de este volante) y dígales que vendan la casa a la organización Center for Community Justice and Advocacy, entonces la familia Hernández puede quedarse en su casa. Fannie vende a inversionistas bajo el mercado, asique puede vender a este Centro a precio favorable. Presiona a tu representante en el congreso a llamar también. 2) Participe en la vigilia en la casa de los Hernández para evitar el desalojo. Envíe su información de contacto (teléfono y correo electrónico) y le avisaremos cuando la orden de desalojo este firmada. Escribanos a DetroitEvictionDefense@gmail.com, o llámenos a UAW Local 600 at 313-429-5009. Dígales que vendan la casa de 1136 Morrell St. en Detroit al Center for Community Justice and Advocacy, así esta organización que no busca hacer ganancia (lucrar) puede vender la casa de nuevo a la familia Hernández por un precio justo! Fannie Mae ha hecho esto antes y puede hacerlo otra vez para evitar un desalojo injusto. Pida a sus representantes en el congreso que contacten a Fannie Mae. Reuniones: Detroit Eviction Defense hace reuniones abiertas todos los Jueves a las 6pm, en Old St. John’s Church, 2120 Russell, Detroit (inmediatamente al sur the eastern market, cerca de la esquina con Gratiot Ave.) Traiga sus inquietudes e ideas. 1136 Morrell St. en Southwest Detroit es una cuadra al este de Junction y tres cuadras al sur de Vernor.